The discussion about changes at the Metropolitan Transportation Authority's (MTA) Vanderbilt Yard has focused on the quality of the permanent replacement yard that Forest City Ratner (FCR) is supposed to build. But the more immediate question concerns the temporary yard, which would result in diminished capacity, perhaps lingering for years, and could leave the MTA facing some challenges in implementing its crucial East Side Access project, which would bring Long Island Rail Road trains to a new station under Grand Central Station, in a project now scheduled for completion in 2015. To apply a metaphor used regarding the value-engineered Atlantic Yards arena, the permanent yard, which would contain seven tracks rather than the promised nine--and just might contain less storage capacity than the current formation--would be the four-burner stove. But the temporary yard--with less capacity, no long-term guarantee, and exposure to the elements--would be more like an outdoor grill. The railyard functions are currently located in the western third of the Vanderbilt Yard: Block 1119. They would be moved, in the case of both the permanent and temporary yards, to the east, mostly to the easternmost third, Block 1121, but with some spillover into the center third, Block 1120. According to the construction schedule attached to the Final Environmental Impact Statement (FEIS), the temporary yard was supposed to take ten months to build, after which it would take 32 months--two and two-thirds years--to finish the permanent yard. The original schedule had the permanent yard opening in March 2010. Shortly afterward--approximately 11 months for the middle block and 18 months for the eastern block--platforms were to be built over the permanent yard. However, as I wrote, there may be no platform if Phase 2 of the project is permanently delayed. And that decreases the incentive to complete the permanent railyard--which is why we should see whether and how the MTA and the Empire State Development Corporation (ESDC) require the permanent yard to be built. Meetings are scheduled next week. 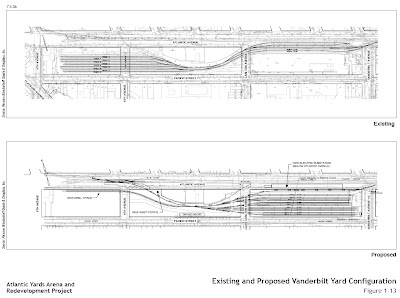 The temporary yard, at least as described in this February 24, 2005 MTA letter (p. 29ff. of this PDF) to Forest City Ratner, would have significant deficits. The graphic (click to enlarge) indicates that storage capacity would be reduced from 72 to 42 cars. The berthing capacity would go from ten consists (trains) to five. 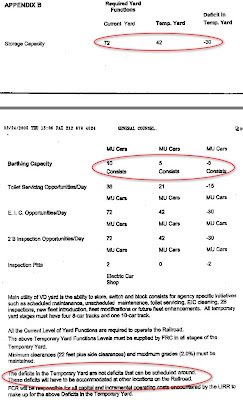 The toilet servicing opportunities per day would go from 36 cars to 21 cars. The opportunities per day for E.I.C. (Extraordinary Interior Cleaning) and inspection would go from 72 cars to 42 cars. The number of inspection pits would go from two to zero--again to be improved in the new yard. The deficits in the Temporary Yard are not deficits that can be scheduled around. These deficits will have to be accommodated at other locations on the Railroad. FCR will be responsible for all capital and incremental operating costs encountered by the LIRR to make up for the above Deficits in the Temporary Yard. Keep in mind that the memo, however, was non-binding, and the exact contours of the temporary and permanent yard remain unresolved, subject to contracts approved by the MTA board, which is what is expected next week. Note that the MTA letter said that the track configuration should "not reduce yard/station capacity or functionality, such determination to be made by MTA/LIRR in its its sole discretion." It also said that Forest City will be required to guarantee the completion of the work, including the New Yard, the deck and the overbuild. Stay tuned for MTA's explanation of how the seven-track railyard does not reduce capacity and whether such a guarantee is provided. 6. MTA's cooperation is conditioned upon FCRC's acknowledgment that VD Yard is essential in its current location and currently performs the function described on Appendix "A" [right] annexed hereto.... 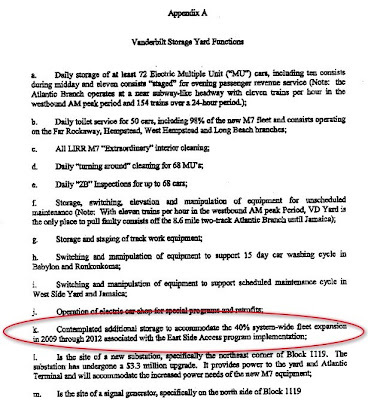 The LIRR's requirements for its safe and efficient service and operating needs, until the new permanent yard is constructed, are described in Appendix "B" hereto [above]. The LIRR reserves the right at FCRC's expense to use self-help, including the right to stop all construction if, in its sole discretion, its minimum functionality requirements are not maintained by FCRC or FCRC is not adequately progressing the work to complete the New Yard by no later than July 2008... The permanent functions for the New York will be set forth in a Design Definition Report ("DDR") to be approved by the LIRR, with such functions to be defined in the LIRR's sole discretion. 9. FCRC must acknowledge that delays in the relocation, reconfiguration and construction of the New Yard may result in significant adverse financial and operational impacts to MTA/LIRR. These impacts include, but are not limited to, increased relocation, reconfiguration, construction and force account costs for projects connected with the East Side Access project and other projects set forth in the MTA's Capital Plan, and maintenance projects; and the cost to mitigate consequential adverse service impacts In the event that FCRC and MTA negotiate a final agreement, such agreement must address reimbursement of MTA/LIRR for such impact costs associated with delays to the New Yard construction. Contemplated additional storage to accommodate the 40% system-wide fleet expansion in 2009 through 2012 associated with the East Side Access program implementation. It's unclear whether and how much additional storage is contemplated as of now, and whether the 2012 date has been pushed back. The DEIS should consider the implications of the proposed reconfiguration of the Vanderbilt Yard on the Cross Harbor Rail-Freight Tunnel, the Metropolitan Transportation Authority’s (MTA’s) East Side Access project, and the JFK rail service to Lower Manhattan. The EIS will not consider the Cross Harbor Rail-Freight Tunnel because the Vanderbilt Yard serves Long Island Rail Road (LIRR) commuter rail operations and cannot accommodate the requirements for freight rail service. Even after the completion of the East Side Access project, the MTA reports that it would have no plans to discontinue operations at the Vanderbilt Yard; the rail yard would still be needed for electric train storage. That seems to be a non sequitur. The concern expressed by the MTA in the 2005 letter was whether the new Vanderbilt Yard would add storage to accommodate East Side Access. But the ESDC dismissed the issue of East Side Access because the railyard would still store trains.